(This issue is discussed in a review in PNAS that can be dowloaded here. See the abstract in the next section). It is well-established that living close to green space reduces overall mortality and cardiovascular disease, and enhances a sense of wellbeing while reducing depressive symptoms. These effects are most striking in people of low socioeconomic status (SES). Why does exposure to green space have this effect? Some argue that living close to green spaces increases exercise, but this is often untrue. Those living in leafy suburbs may be obliged to take a car to go anywhere at all. Others argue that the green space may increase social interactions, and so boost “social capital”. This might sometimes be true, but more often multiple other institutions (places of worship, pubs, cafes, community centres, clubs, team sports etc) play this role. A more common interpretation of the green space effect attributes it to an evolved psychological phenomenon similar to “habitat selection” in other species. We evolved as hunter-gatherers in open spaces, usually following rivers, coast lines and the shores of lakes. Therefore contemplation of such environments might fulfil a psychological need. There is convincing evidence of short term psychological effects following exposure to green spaces. These effects can be proven, not only using psychological testing, but also using portable electroencephalograms, salivary cortisol, blood pressure and a variety of cardiac parameters. So these short-term physiological effects do exist. But are they the crucial explanation for the green space effect? There are two problems with the psychological work. First, it is not clear that short periods of “nature-induced” relaxation (even if repeated at intervals) would cause the long-term effects on survival and wellbeing that are undoubtedly associated with proximity to green spaces. Secondly, and more important, is the lack of essential controls in much of the psychological work. The green space exposure is usually compared with exposure to an urban scene or busy urban street. A second control is needed to prove specificity. In other words, would sitting in a quiet urban bar, listening to soothing music, holding a glass of cold beer have the same effect as the green space? It could be that the Green Space effect is an additive phenomenon, attributable in part to all three mechanisms suggested above. However the Old Friends mechanism can add a 4th mechanism that in some ways seems more convincing than the other three, because it can be documented by physiological measures that relate directly to the disorders from which green spaces protect us. We may indeed have evolved to need the psychological input from the natural environment. But just as important, our immune systems have evolved to require inputs from biodiversity of the natural environment, and as other pages explain, this input affects wellbeing, chronic inflammatory disorders, and psychiatric conditions. Epidemiological studies suggest that living close to the natural environment is associated with long-term health benefits including reduced death rates, reduced cardiovascular disease, and reduced psychiatric problems. This is often attributed to psychological mechanisms, boosted by exercise, social interactions, and sunlight. Compared with urban environments, exposure to green spaces does indeed trigger rapid psychological, physiological, and endocrinological effects. However, there is little evidence that these rapid transient effects cause long-term health benefits or even that they are a specific property of natural environments. Meanwhile, the illnesses that are increasing in high-income countries are associated with failing immunoregulation and poorly regulated inflammatory responses, manifested as chronically raised C-reactive protein and proinflammatory cytokines. This failure of immunoregulation is partly attributable to a lack of exposure to organisms (“Old Friends”) from mankind’s evolutionary past that needed to be tolerated and therefore evolved roles in driving immunoregulatory mechanisms. Some Old Friends (such as helminths and infections picked up at birth that established carrier states) are almost eliminated from the urban environment. This increases our dependence on Old Friends derived from our mothers, other people, animals, and the environment. It is suggested that the requirement for microbial input from the environment to drive immunoregulation is a major component of the beneficial effect of green space, and a neglected ecosystem service that is essential for our well-being. This insight will allow green spaces to be designed to optimize health benefits and will provide impetus from health systems for the preservation of ecosystem biodiversity. Flandroy L, Poutahidis T, Berg G, Clarke G, Dao M-C, Decaestecker E, Furman E, Haahtela T, Massart S, Plovier H, Sanz Y, Rook GAW. The impact of human activities and lifestyles on the interlinked microbiota and health of humans and of ecosystems. Science of the Total Environment. 2018;627:1018-38. This paper analyses parallels between the microbiota of humans, other animals, soil and plants, and discusses the ways in which human activity is damaging microbial biodiversity. It also outlines educational and societal measures that we need to adopt to protect this biodiversity. See abstract of the paper on the “Microbial Biodiversity” page. This paper can be downloaded here. The health benefits of green space…… psychology or biology? A paper published by the Centre for Urban Greenery and Ecology (CUGE) in issue #11, pages 50-59 of “CITYGREEN”. 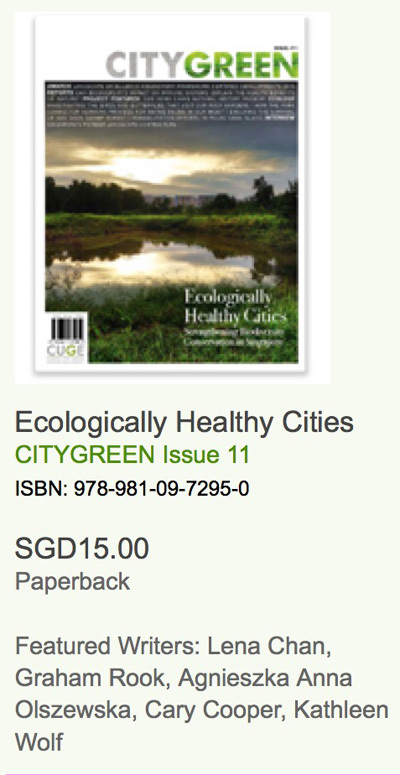 The entire issue #11 of CITYGREEN is available from the CUGE site for 15 Singapore dollars. This paper explores some of the same issues as the PNAS review, but attempts to explain the arguments in terms comprehensible to non-medical and to non-specialist readers. Another interesting issue is why approximately 1/3 of the organisms in the gut microbiota are spore-forming. There is now excellent evidence that some spore-forming soil organisms are in fact capable of germinating in the human small bowel, and then replicating there before sporulating when they enter the colon...... and then re-entering the environment. "Microbial "Old Friends", immunoregulation and socio-economic status"
or directly from this website. Microbial Old Friends, immunoregulation and stress resilience. Enter description here. Rook GAW, Lowry CA, Raison CL. Chronic inflammatory diseases (autoimmunity, allergy and inflammatory bowel diseases) are increasing in prevalence in urban communities in high-income countries. One important factor is reduced exposure to immunoregulation-inducing macro- and microorganisms and microbiota that accompanied mammalian evolution (the hygiene hypothesis or ‘Old Friends’ mechanism). Reduced exposure to these organisms predisposes to poor regulation of inflammation. But inflammation is equally relevant to psychiatric disorders. Inflammatory mediators modulate brain development, cognition and mood, and accompany low socioeconomic status and some cases of depression in developed countries. The risk of all these conditions (chronic inflammatory and psychiatric) is increased in urban versus rural communities, and increased in immigrants, particularly if they move from a low- to a high-income country during infancy, and often the prevalence increases further in second generation immigrants, suggesting that critical exposures modulating disease risk occur during pregnancy and infancy. Diminished exposure to immunoregulation-inducing Old Friends in the perinatal period may enhance the consequences of psychosocial stressors, which induce increased levels of inflammatory mediators, modulate the microbiota and increase the risk for developing all known psychiatric conditions. In later life, the detrimental effects of psychosocial stressors may be exaggerated when the stress occurs against a background of reduced immunoregulation, so that more inflammation (and therefore more psychiatric symptoms) result from any given level of psychosocial stress. This interaction between immunoregulatory deficits and psychosocial stressors may lead to reduced stress resilience in modern urban communities. This concept suggests novel interpretations of recent epidemiology, and novel approaches to the increasing burden of psychiatric disease. Effect of exposure to natural environment on health inequalities: an observational population study Enter description here. BACKGROUND: Studies have shown that exposure to the natural environment, or so-called green space, has an independent effect on health and health-related behaviours. We postulated that income-related inequality in health would be less pronounced in populations with greater exposure to green space, since access to such areas can modify pathways through which low socioeconomic position can lead to disease. METHODS: We classified the population of England at younger than retirement age (n=40 813 236) into groups on the basis of income deprivation and exposure to green space. We obtained individual mortality records (n=366 348) to establish whether the association between income deprivation, all-cause mortality, and cause-specific mortality (circulatory disease, lung cancer, and intentional self-harm) in 2001-05, varied by exposure to green space measured in 2001, with control for potential confounding factors. We used stratified models to identify the nature of this variation. FINDINGS: The association between income deprivation and mortality differed significantly across the groups of exposure to green space for mortality from all causes (p<0.0001) and circulatory disease (p=0.0212), but not from lung cancer or intentional self-harm. Health inequalities related to income deprivation in all-cause mortality and mortality from circulatory diseases were lower in populations living in the greenest areas. The incidence rate ratio (IRR) for all-cause mortality for the most income deprived quartile compared with the least deprived was 1.93 (95% CI 1.86-2.01) in the least green areas, whereas it was 1.43 (1.34-1.53) in the most green. For circulatory diseases, the IRR was 2.19 (2.04-2.34) in the least green areas and 1.54 (1.38-1.73) in the most green. There was no effect for causes of death unlikely to be affected by green space, such as lung cancer and intentional self-harm. INTERPRETATION: Populations that are exposed to the greenest environments also have lowest levels of health inequality related to income deprivation. Physical environments that promote good health might be important to reduce socioeconomic health inequalities. We are at a key juncture in history where biodiversity loss is occurring daily and accelerating in the face of population growth, climate change, and rampant development. Simultaneously, we are just beginning to appreciate the wealth of human health benefits that stem from experiencing nature and biodiversity. 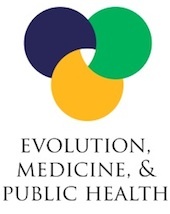 Here we assessed the state of knowledge on relationships between human health and nature and biodiversity, and prepared a comprehensive listing of reported health effects. We found strong evidence linking biodiversity with production of ecosystem services and between nature exposure and human health, but many of these studies were limited in rigor and often only correlative. Much less information is available to link biodiversity and health. However, some robust studies indicate that exposure to microbial biodiversity can improve health, specifically in reducing certain allergic and respiratory diseases. Overall, much more research is needed on mechanisms of causation. Also needed are a re- envisioning of land-use planning that places human well-being at the center and a new coalition of ecologists, health and social scientists and planners to conduct research and develop policies that promote human interaction with nature and biodiversity. Improvements in these areas should enhance human health and ecosystem, community, as well as human resilience. Environmental biodiversity, human microbiota, and allergy are interrelated Enter description here. Hanski I, von Hertzen L, Fyhrquist N, Koskinen K, Torppa K, Laatikainen T, Karisola P, Auvinen P, Paulin L, Makela MJ, Vartiainen E, Kosunen TU, Alenius H, Haahtela T.
Proc Natl Acad Sci U S A. 2012 May 7. Rapidly declining biodiversity may be a contributing factor to another global megatrend-the rapidly increasing prevalence of allergies and other chronic inflammatory diseases among urban populations worldwide. According to the "biodiversity hypothesis," reduced contact of people with natural environmental features and biodiversity may adversely affect the human commensal microbiota and its immunomodulatory capacity. Analyzing atopic sensitization (i.e., allergic disposition) in a random sample of adolescents living in a heterogeneous region of 100 x 150 km, we show that environmental biodiversity in the surroundings of the study subjects' homes influenced the composition of the bacterial classes on their skin. Compared with healthy individuals, atopic individuals had lower environmental biodiversity in the surroundings of their homes and significantly lower generic diversity of gammaproteobacteria on their skin. The functional role of the Gram-negative gammaproteobacteria is supported by in vitro measurements of expression of IL-10, a key anti-inflammatory cytokine in immunologic tolerance, in peripheral blood mononuclear cells. In healthy, but not in atopic, individuals, IL-10 expression was positively correlated with the abundance of the gammaproteobacterial genus Acinetobacter on the skin. These results raise fundamental questions about the consequences of biodiversity loss for both allergic conditions and public health in general. Natural immunity. Biodiversity loss and inflammatory diseases are two global megatrends that might be related Enter description here. von Hertzen L, Hanski I, Haahtela T.
We are witnessing two global and deeply worrying trends that, at first glance, seem unrelated. the first trend is the ongoing decline in bio­diversity, which is caused by human actions. It could well become the sixth mass extinc­tion of animal and plant species on Earth, comparable in magnitude with the fifth mass extinction at the end of the cretaceous, 65 million years ago. the second trend is a rapid increase in chronic diseases that are associated with inflammation, especially in developed countries. inflammation is a key attribute in asthma and allergic dis­eases, autoimmune diseases and many can­cers; even depression has been associated with the presence of inflammatory mark­ers. in this article, we argue that these two phenomena are more closely related than commonly thought: declining biodiversity might actually increase the risk to humanity from chronic diseases and thereby cause a major public health problem.